The Maine Outdoorsman: Paintball blues . . .
Paintball blues . . . I have to admit that as I sit here at work today I am suffering. My head feels swollen and every muscle in my body is aching. IN addition I have marble size welts erratically covering me from head to toe. No, I haven't contracted some horrible disease and no I don't have lyme carrying ticks nibbling on my epidermis what I have friends is a BAD case of the after effects of a full day of PAINTBALL. The day certainly started innocently enough with a call from a neighbor who was inquiring if I in fact had ever played paintball. Well it had been YEARS but since I had all the gear I thought I would give it a try. He said to meet him at his house around 9:30 and there would be a "few" friends of his that would be joining us. Well upon arriving I found his door yard PACKED with vehicles and 20 or more fanatics gathering in his garage. Now folks, I like to shoot a person with a paintball just as much as the next person but let me tell you these boys were VERY serious. Each person had ALL of the gear and the latest in equipment. I felt severely as a disadvantage with my stock 98 Tippman. Well, I went through the introductions and organized my limited gear and was soon put on a team with 10 other guys . . . we were the "white" team and arm bands made of duct tape identified us as such. We were chosen first to hide and the other were chosen to search us out. We were playing on a "woods" course and it was rough to say the least. Fallen down logs, branches, boulders, etc. I was glad to have a face mask because it saved me from being blinded several times. The first game went something like this. I laid down in a ditch waited about 5 minutes and a guy shot me in the back . . . done. I walked back to the garage where I sipped off a keg until the rest of my team was eliminated. Second game it was my teams turn to search and hopefully destroy . . . I shot a guy and then his buddy shot me. I narrowly missed being hit in a delicate area by a paintball traveling at something around 200 feet per second. There is currently a welt on my inner thigh the size of a golf ball. Both of us walked back to the house and I was fed a shot of some liquor that burned my throat. Third game I pulled out the secret weapon . . . my ghillie suit that I had been hiding this whole time under my jacket. As I laid in the leaves, I piled others up on top of the suit and all but disappeared from view behind a small rock. I sat there motionless until two guys walked in front of me then I shot them both before they even realized I was there. As another ran in for support he must have thought I was behind a tree because he started frantically shooting in that direction . . . I waited until he walked right up to about 10 yards and I shot him as well. Man, was it possible I was finally getting the hang of this? I could hear a team member calling for assistance and I got up and shot one more guy who was circling my teammate . . . unbeknownst to me that ended the game! I had personally shot almost 1/2 the opposing team! Fourth game . . . no joke I shot one of my own guys and then walked into an ambush of three guys. They (apparently unhappy I had eliminated them in the earlier game) proceeded to shoot at me until I lay on the ground curled up in a ball crying like a little girl. Well at this point, I wish I had ended a game early and had left with some level of self respect and a great memory from game three BUT all in all it was a great time! I got invited back and in two weeks I will be playing again. Guess in the meantime I need to figure out the finer points of guerilla tactics or download a marine corps manual! Well until next time Semper Phi?!?!?!! LOL! HAHA yeah a few years back my brothers and I did a woods course.It was my first time and yeah the "serious" people were a bit spooky.However it's the teenagers you have to watch out for they just won't stop at one hit.Good luck healing up. 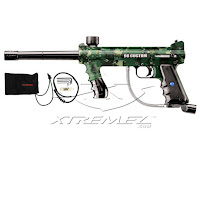 When my wife and I first started dating I picked up a couple of cheap paintball guns and we would break them out when we had an argument we couldn't settle. It hurt like hell, but i'm convinced it saved my life.... She's a REALLY good shot...scary good. TBD, I agree with the teenagers . . . it takes several hits to put them down and the won't stop pulling the trigger on you until you start firing back! NM, I bought my wife a gun and she played a few times she was a much better player than I was. While I would charge head first into a battle and get wiped out quickly she would hang back, hide and wait for a good opportunity . . . I used to call her the assassin! 2008 Deer Season Update . . .